Dépt. De La Côte D'Or. N°20. [ Lyon ] - LEVASSEUR, V.
Title : Dépt. De La Côte D'Or. N°20. [ Lyon ]. Map maker : LEVASSEUR, V.. Date : Paris, A. Combette, 1852. Size : 11.4 x 16.5 inches. / 29.0 x 42.0 cm. Description :Map of the Burgundy area, centered on Lyon. Lovely map from one of the last decorative atlases of the nineteenth century. The rather simple map is framed by medallion portraits and coats of arms, and is set against a background of scenes of the countryside, products and activities indigenous to the region filling the foreground. Victor Levasseur's "Atlas National Illustré" and "Atlas Universel Illustré" are among the last great decorative atlases published. 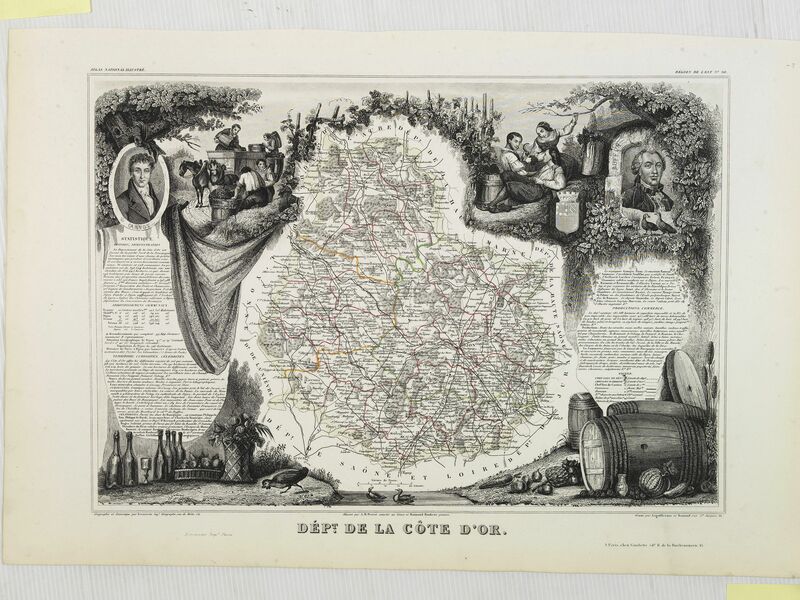 This map comes from the Atlas National Illustré. Condition : Very good condition. Steel engraved map in original out-line colours, the outer decoration is uncoloured, as issued.